The holidays might be over; but that doesn't mean the end of giving gifts. We're giving away five (5) Blu-ray DVD copies of Steve Jobs, courtesy of Universal Pictures Home Entertainment; and all you have to do is provide your name, email and mailing address... No trivia questions, running through hoops, etc.. How easy is that? We'll select five winners (one DVD per household) and ship your prize via FedEx or USPS (later this month.) All entries must be received by Friday, February 12th at 11:59 PM EST. Good luck! Synopsis: Witness the founder of Apple like never before. Steve Jobs paints an intimate portrait of the brilliant man at the epicenter of the digital revolution, backstage in the final minutes before three iconic product launches. Directed by Academy Award winner Danny Boyle (Slumdog Millionaire) written by Academy Award winner Aaron Sorkin (The Social Network) and starring Michael Fassbender, Kate Winslet, Seth Rogen and Jeff Daniels. 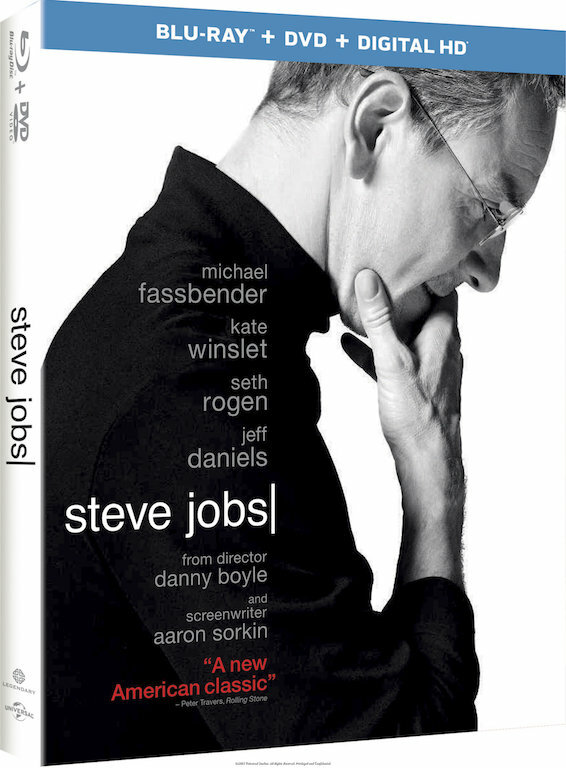 Steve Jobs is available on Digital Now/Blu-ray & DVD, Tuesday, February 16, 2016. Click here to purchase online.